I’m a chocolate purist. No need to hide it. I fell in love with the amazing flavors quality cocoa and chocolate can offer to those who take the time to discover them. But the chocolate market seems to be booming with flavored chocolates and bars with inclusions. I’ve tried many, from different chocolate makers and different styles. But they have a hard time convincing me. Many are made with bland chocolate, use overpowering ingredients or go for far fetched combinations. Cocoa nibs are so far the only added inclusions I like, as they give can give an extra dimension to a chocolate bar if well done. So when I discovered Amazing Cacao during the Chocoa event in Amsterdam earlier this year, I immediately went for their dark chocolate origin bars. When I started talking to Olga Yarovikova and her colleague, I mentioned how I only like plain dark origin chocolate bars. Olga’s eyes started to twinkle and a little smile formed on her lips. She pointed me to a sample plate and said, I’d like you to try this one. Their Indian dark chocolate & Masala Chai bar. Without any expectations, I did. And within minutes I was sampling all of their flavored range. So today I have the pleasure of introducing you a bar which managed to surprised me. But first, I want to tell you something more about Amazing Cacao. They are the very first Russian chocolate maker featured on my site. That’s right, Russia. A country I would have never connected to chocolate making. Vodka and Kaviar, yes, but chocolate? Never. I heard from other Russian nationals, that most Russian chocolate is of the sweeter, industrial kind. But as origin chocolate is taking the world by storm, it is no surprise that Russian chocolate makers step to the plate as well. 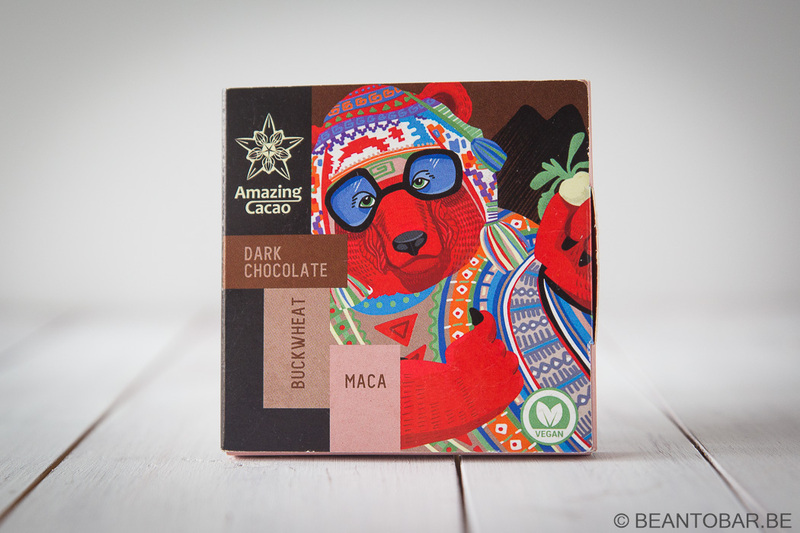 Amazing cacao is based in Saint-Petersburg and doesn’t simply make chocolate. They import an distribute quality cocoa, coffee, sugar, panela and even chocolate making equipment. Their focus on bringing the amazing natural flavors of those quality products to the consumer. They don’t stop just their. Fancy a take on making chocolate yourself? Amazing Cacao even gives workshops and training in chocolate making on different levels of experience. I must say, in the overwhelming amount of new chocolate makers at Chocoa, they certainly stood out. And I walked out with some of their bars. Today I want to focus on a more special chocolate. It’s not even simply infused or using inclusions, it is actually a filled chocolate bar. 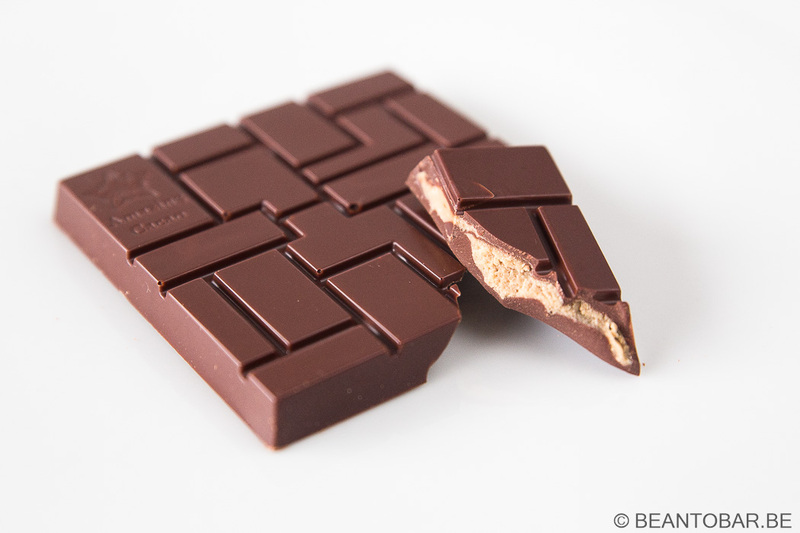 Buckwheat and Maca in dark chocolate. The bar comes in square form. It looks small but weighs 60 g. On the cardboard box on the outside, a Russian looking bear figure is shown. The company logo, dark chocolate, buckwheat and maca are mentioned. Cryptic and minimalistic. On the side of the bar it is noted that the chocolate is 70%. On the back more info in Russian Cyrillic script. As my knowledge of Russian is also very minimalistic, I was glad to see every text is translated in English. On the back, the ingredients are displayed. Cocoa liquor, cane sugar, cashew, cocoa butter, buckwheat, coconut milk, panela, yellow maca and sea salt. Quiet an extensive list if you compare to plain dark chocolate, but all natural ingredients. Makes you wonder how he mix will work out. Open the box and the wonderment starts. More text in Russian and English. 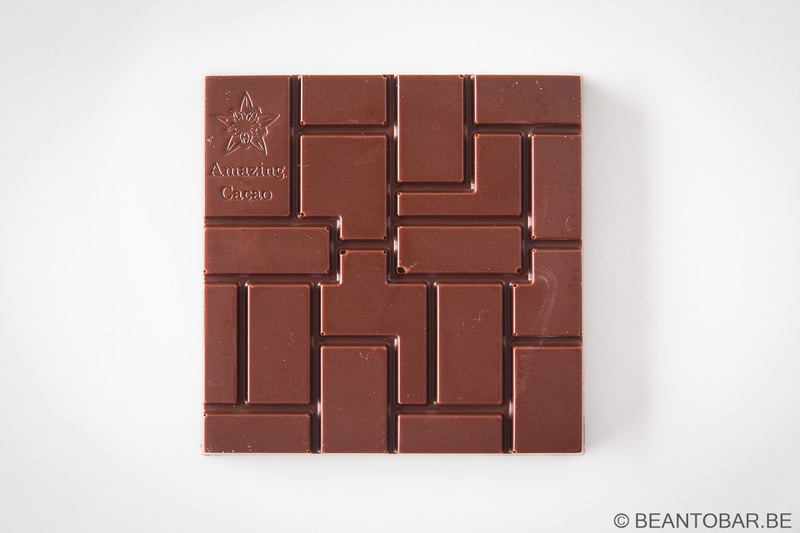 Aha, here we find out that the dark chocolate is made with Peruvian cocoa and buckwheat – a traditional Russian grain. I’m familir with buckwheat as an ingredient for pancakes in my home kitchen, but I would never have thought about pairing it with chocolate. The other ingredient, Peruvian Maca is an unknown product to me. Google revealed it is a Peruvian root used to be turned into a flour used in bread, cakes or pancakes. Seems logical to pair both crops. The bar is placed in a plastic box. The chocolate simply looks divine! Sleek, very glossy and with a great minimalistic scoring into cubist pieces. I think I’m in love. The entire process of opening the little box and all the info on the wrapper makes it feel like you are going through a treasure hunt. The bar itself is a prize on its own. Taste: starts sweet with roasted nuts and a flash of tobacco, before a spicy tone keeps growing. The warm flavor entwines with the chocolate flavor and reminds me of ginger, cinnamon, cardamom and a slight cereal hint. The flavor is flowing on a back tone of sweet brown sugar, honey, bread and cocoa. It is impressive to notice all these flavors mingling in, while remaining harmonious. Every now and then, a small hint of yellow fruits break through the main flavor and give it just a nudge of freshness. It all ends almost to quickly as you try to hold on to the flavors who disappear. Soon they make room for the after flavor of cocoa and nutty praline, ending with a lasting note of chocolaty wood – so typical for a nice dark chocolate. This is not your average dark chocolate flavor profile such as a three step flavor rocket or a harmonious evolving taste. It’s more like standing in a river of flavor who grabs you and takes you over the edge of an aroma waterfall, a plunge you are very willing to take. Olga definitely knows how to combine flavors and knows her origin cocoa. The Peruvian chocolate with nutty, yellow fruit accents pairs extremely well with the mild yet clear spiciness of the buckwheat/maca filling. The nutty, breadlike tone of the buckwheat doesn’t clash with the chocolate, it rolls over the main flavor like a gentle wave on a beach. Yet somehow, the chocolate remains standing in the river of aromas. At the beginning of the melt and the end, it clearly shows the typical origin chocolate notes and is very enjoyable on itself. As the filling is not super evenly spread through the bar, the feeling in the mouth is a tad different from plain chocolate, but it melts beautifully and the texture of the filling is identical to the chocolate’s one. Where I expected a little more grain in the buckwheat/maca filling, it actually is really smooth. Well done miss Yarovikova, I’m definitely impressed by this seductive bar.